I live in a town that was invaded by foreign nationals. No, I do not live in the Middle East or the Middle Ages. 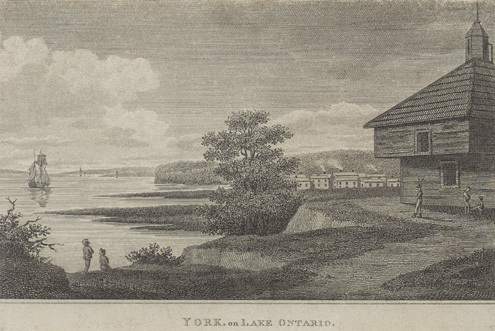 The town was York, later becoming Toronto. In 1813, the town was twenty years old. It had merchants, builders, carpenters, storekeepers, surveyors, soldiers, sailors, free and enslaved blacks, civil servants, drunks, petty thieves, remittance men, doctors, judges, clergymen, land speculators, a midwife, a baker, a brewer, and ordinary folk. Not to mention transient farmers, natives, peddlers, and con men. It had a newspaper, a church, a school, a courthouse, a jail, a post office, a tannery, shipbuilding, wharves, hotels, theatrical performances, outdoor winter amusements, and some fine social distinctions. Altogether your normal little town. "York on Lake Ontario," [looking west from the blockhouse, the fort is far in the distance]; print of engraving by William Leney; Toronto Public Library. 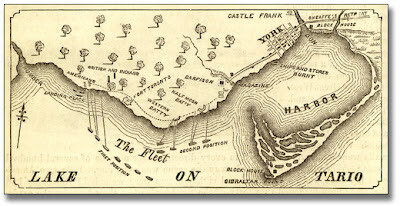 Fort York to the west of the town guarded the entrance to Toronto Harbour (there was no Eastern Gap in those days). 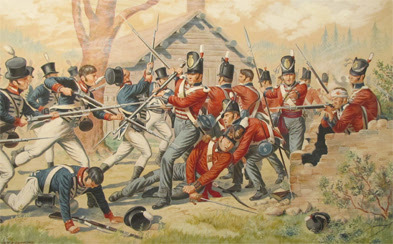 Upper Canada did not have an army. It was a British colony and British troops manned a network of fortifications along the Great Lakes system. By law, a sedentary militia of able-bodied inhabitants was required to muster once a year, when training was minimal if anything. On 19 June 1812, the United States declared war on Britain. One of their intentions was to gain and absorb the British colonies to the north. By 1813 the majority of our troops were occupied at the Niagara border, along the eastern waterways, at Lake Erie, and westward to Detroit. York was safe, wasn't it? ... because it was well away from border territory. Wrong. On 27 April 1813 the Americans sailed across Lake Ontario, reinforced by their naval guns, and overwhelmed the inadequate garrison numbers at Fort York. The British soldiers finally retreated to Kingston after blowing up the fort's powder magazine—a huge explosion that killed or wounded hundreds. During six days of occupation, the fearful citizens of York saw American commanders lose control of their troops who pillaged and looted, burning homes and buildings. Torching the Parliament buildings was a final insult. In December 1813, invading forces also burned down the town of Newark (Niagara-on-the-Lake) to leave the residents homeless in winter. Retaliation was inevitable. Part of it came the following year in August when the British Navy burned Washington and its White House. Fight and burn. What were we all thinking? The Market Gallery, poster for "Finding the Fallen: The Battle of York Remembered." Revival of the great debate--Who Won?--should educate younger generations in both nations; it's being conducted, on the whole, with better humour than the original conflict. After all, Americans did not win the British North American colonies. Canadians defeated a takeover (thanks to regular troops and a resurgent militia). Sadly, our staunch Indian allies were the main losers; the proposal for a neutral Indian zone in the west was rejected in the Treaty of Ghent. Repeat: What were we all thinking? History, or historians, tell us that the War was the birth moment of pride in our own country. Canada .. and Ontario .. and Toronto .. have hundreds of events planned to commemorate the War of 1812. A shot of adrenalin for our modest but committed patriotism. We want to share everything—no holds barred—with our cousins across “the world's longest undefended border.” Or does that mean downtown Toronto bars will be open all hours. Debatable. In this city, military and civilian reenactors will be appearing on the streets. The First Parliament Interpretive Centre is already exhibiting “Foundations & Fire: Early Parliament and the War of 1812 Experience at York.” From March 3rd the St. Lawrence Market Gallery will feature “Finding the Fallen: The Battle of York Remembered.” Fort York itself will have any number of spectacular events in the spring and summer, and yes! oh thank goodness, a grand military PARADE! I'd really like to know where that fire engine is! Eric Wilfrid Hounsom, Toronto in 1810 (Toronto: The Ryerson Press, 1970), 180. So far, I have not determined what museum this would be. Any help from readers? From a work in progress: regarding John Fraser, “from Inverness-shire,” who emigrated about 1805 to settle on the River Rouge Road, St. Andrews East, Argenteuil County, Quebec. John’s second wife Margery McIntyre is my direct ancestor but her background is as obscure as that of his first wife, Ann Fraser. Margery was born about 1785 and died at St Andrews, Quebec, (“Marjory McIntyre, widow of Jn. Fraser”) 16 May 1869 at age 84. Her age at death is consistent with her age at their marriage date. She was also recorded as Mary, Margaret or Marion in different sources. Page by page searches of the 1861 census for the parish fail to show where and with whom she was living; the Ancestry database is equally unrewarding. Although the Presbyterian church register gives us her date of death, as with husband John there is no surviving gravestone. The few McIntyre burials in St. Andrews Cemetery are not enlightening. Perhaps a Catherine McIntyre, age 75 in the 1851 census at St. Andrews and married to John Cameron age 88, is her sister or close relative. That census—the only record where Catherine has been found to date—places her birth year ca.1777. 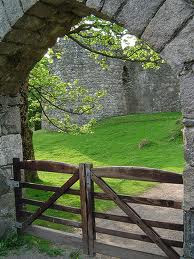 The Cameron couple were in the River Rouge cluster two households away from Margery’s stepson James Fraser. Angus Cameron age 34 (born in Canada) is living with them; he is married to Harriett Dochsteter and they have two very young children. Angus appears to be the son of John and Catherine, born in the last years of Catherine’s fertility. The incumbent of the Grenville & Chatham Presbyterian Church performed the Cameron-Dochstetter marriage on 25 September 1844 at River Rouge; Ewen Cameron and Peter Taylor were witnesses. Parents of the bride and groom were customarily not recorded by the clergy. The same register contains a whole slew of Cameron marriages—I expect some of them were children of John and Catherine. According to local history compiler Thomas, a John Cameron came to Côte du Midi in Argenteuil “about 1802.” If this man, known as Preacher Cameron, is the same as the 88-year-old in 1851, then his storied origin in Fort William, Scotland, could be significant for McIntyre research. An Internet correspondent confirmed that the “Preacher” was indeed Catherine McIntyre’s husband, but he/she has not replied with a source for the information. Unfortunately, I have not found a marriage for John and Catherine (parameters 1793-1806) in the parish registers database of ScotlandsPeople, nor in early Presbyterian registers of Quebec. It’s possible they were married by a dissenting minister whose records are unavailable. Baptisms of Catherine and Margery (various spellings) born to a McIntyre couple in the relevant time span are also not forthcoming. The Internet provides several avenues for essential background information. Preacher clearly implies that John Cameron had the gift of oratory (no doubt based on intensive bible studies) to spread the gospel. In pioneer times, such a man was a great comfort to the faithful in the absence of an ordained minister. Just in case, I did look at Fasti Ecclesiae Scoticanae (potted biographies of Scottish clergy) but did not find the volume for Inverness-shire; Argyll presented no likely John Camerons. An important step is to acquaint myself with the location. Fort William in Scotland, purported origin of John Cameron, refers to both a fort and a town, strategically located at the north end of Loch Linnhe. The site is said to be in the parishes of Kilmallie and Kilmonivaig. Accordingly, Kilmallie straddles the Great Glen, and its northwestern portion is the only Argyll component; Kilmonivaig shares the intersection in Fort William and then falls south of its sister parish. While the FamilySearch Wiki places Kilmallie completely in Argyll, other sources say the town is in Kilmallie, Inverness-shire. The former source states basically there are no marriage records from September 1790 to February 1811; kirk sessions records exist only from 1836. The town had name changes over the centuries ... Gordonsburgh, Maryburgh, Duncansburgh, and finally the burgh of Fort William. I can see the headache coming ... fluid parish boundaries and jurisdictions will make for interestingly complex research (assuming there are some sources to investigate)! I’m also aware that an emigrant who said he was “from” a certain place may have named it only as the nearest, presumably better-known, point of reference. The first Statistical Account of Scotland tells me more about the parish and its people. Rev. Mr. Alexander Fraser compiled the Kilmallie report. At this time in the 1790s, the town was referred to as Maryburgh (population 1,200 with 194 at the fort garrison). In brief, the inhabitants (apart from the town) raised cattle and crops of oats, barley, and potatoes; their diet consisted largely of the latter. Their noted prejudice against smallpox inoculation seems indicative of a general Highland distrust of intrusive authority. It was customary for many to migrate seasonally to “the Low Countries” at harvest time for employment. Cameron of Lochiel and the Duke of Gordon were two of the main estate owners. I am a long way from connecting any dots to the unproven McIntyre sisters! 1. St. Andrews (St. Andrews East, Quebec) Presbyterian register, Vol. III, p. 60; correspondence Rev. W. Harold Reid to Brenda Merriman, 23 September 1970. 2. St. Gabriel Street (Montreal, Quebec) Presbyterian [first] register of baptisms, marriage, and burials, p. 47, Fraser-McIntyre marriage, 1808; Archives of Ontario (AO) microfilm MS 351 reel 1. Also, “Quebec Vital and Church Records (Drouin Collection) 1621-1967,” digital image, Ancestry.ca (www.ancestry.ca/ : accessed 19 April 2008) where he is indexed as John Francer. 3 John Cameron household, 1851 Census Canada East, District 33, Deux Montagnes, E.D. 11, parish of St. Andrews, sheet 21, stamped p. 41; LAC microfilm C-1147. 4 “Quebec Vital and Church Records (Drouin Collection) 1621-1967,” digital image, Ancestry.ca (http://www.ancestry.ca : accessed 25 September 2011), Cameron-Doxstader marriage, 1844; citing Chatham-Grenville Presbyterian register, p. 45. 5. Cyrus Thomas, Histories of the Counties Argenteuil, Quebec and Prescott, Ontario (1896; reprint Bellevville, ON: Mika Publishing, 1981), 144. 6. Anders153, “Still looking for McLean connections in River Rouge, Cote du Midi, St. Andrews E,” Rootsweb’s Argenteuil message board (http://boards.ancestry.com/localities.northam.canada.quebec.laurentides.argenteuil), 3 September 2011. 7. Fasti Ecclesiae Scoticanae, Google books; accessed 14 February 2012. 8. ScotlandsPlaces (http://www.scotlandsplaces.gov.uk/ : accessed 14 February 2012). 9. “Kilmallie, Argyl[sic], Scotland,” FamilySearch Wiki (https://www.familysearch.org/learn/wiki/en/Kilmallie,_Argyl,_Scotland : accessed 15 February 2012). 10. Ordnance Gazetteer of Scotland, vol. 6, p. 498, digital image, Electric Scotland (http://www.electricscotland.com/history/gazetteer/vol6page498.htm : accessed 15 February 2012). 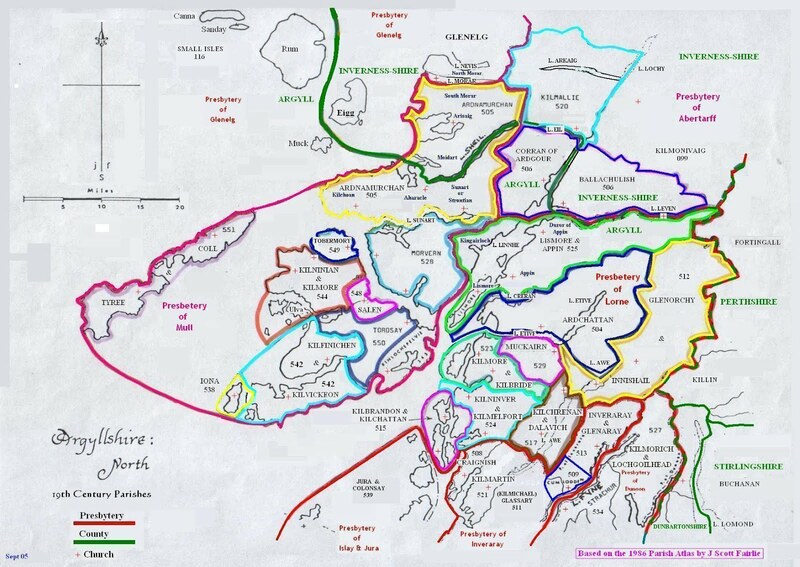 “Maps of north and south Argyll Parishes – 19th Century,” Lochaber and North Argyll Family History Group (http://www.lochaberandnorthargyllfamilyhistorygroup.org.ukid70.html : accessed 15 February 2012). 11. 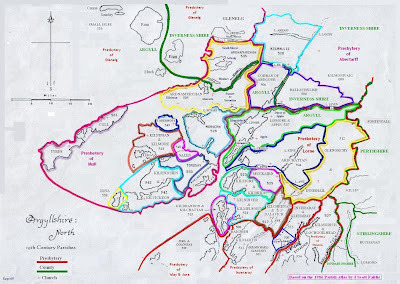 Gazetteer for Scotland (http://www.scottish-places.info/towns/ : accessed 14 February 2012). 12. Sir John Sinclair, Statistical Account of Scotland, 1791-1799, vol. 8 [includes Inverness-shire], p. 410; University of Edinburgh, Edina Data Centre (http://stat-acc-scot.edina.ac.uk/sas/sas.asp?action=public&passback= : accessed 14 February 2012). It's time for a little colour on a cold day. The North Market, Front Street, Toronto. Photograph 2011, BDM. Loyalists: Eligibility -- Common Sense or Splitting Hairs? Ah, yes. We’ve been talking about eligibility ... most recently (my prior post on the subject) about successful application for regular membership in the United Empire Loyalists’ Association of Canada (UELAC). Which is also a corollary to this post. Because membership eligibility and the ancestor’s eligibility are two sides of the same coin. This is the sixth in a small series about Loyalist ancestors. ■ A member of the Six Nations of either the Grand River or the Bay of Quinte Reserve who is descended from one whose migration was similar to that of other Loyalists. ■ Women whose documentation demonstrates loyalty above and beyond being spouses of Loyalists. ■ Some "Late Loyalists" who arrived in Canada after 1789. You see how the collected experience of applicants and branch genealogists assists both groups in determining eligibility of the ancestor in question. Some thorny issues have been resolved, for example, the demonstrable Loyalist who died before reaching British territory. Other issues are not so clear or perhaps more contentious, such as a “cut off” date of arrival for the Loyalist. Occasionally it’s possible to uncover the reasons why some individuals lingered on American soil long after the War concluded. Or why some would return to an American state years after leaving it. Is the status of Francophone residents of British colonies who took up arms and/or supported the British forces still in limbo? They had not been residents of the (rebelling) “American colonies” before 1775. Some lost property; some did not. Records created by contemporary officials can contain variations in the recognition of UE status from one person to another. You only have to compare some entries on the various lists to get an inkling of that. Not finding indisputable direct evidence, some society applicants will have to collate a proof argument for the ancestor’s status/eligibility from less obvious sources and/or the avenues of whole-family research. Thus both the ancestor and admittance to regular UELAC membership frequently remain to be proved on a case by case basis. England saw a steady stream of displaced Loyalists arriving during and after the War period, most requiring financial assistance. The initial hearings of claims for losses began August 1782 in London. At that time, the commissioners made probably the first attempt at fine distinctions of loyalty and service, for compensation purposes. Their deliberations preceded Dorchester’s landmark resolution, so the reports make interesting reading (as do the concurrent parliamentary debates). Since then, as you see above, fine distinctions are still being explored. And that makes more blog discussion possible. Talking to myself is not productive. Bloggers always appreciate comments on their posts; all points of view are welcome. Dialogue is healthy. For the sake of brief entries, I am not footnoting the facts in this ongoing memorial. Sources have been noted either in other blog posts or in my family history books. 2 February 1854 William Charles Dougall was born at Vankleek Hill, Canada West, second child and second son of Peter Dougall and Catherine “Kate” Fraser. His parents moved to the town of Renfrew, Ontario, where William grew up. He went to school until at least the age of 14 and worked with his blacksmith father in building horse carriages. William followed his older brother John to Winnipeg, Manitoba, by 1891 to start a carriage-making business. William was my paternal grandfather who died long before I was born. 4 February 1906 Otto Freibergs was murdered by Tsarist troops at Madliena, Riga District, Latvia. Otto's story was told in a previous blog. Conflicting information surrounds his date of death, complicated by distance and the foreign language factor. The date of death given here came from his son in 1933 in the Book of Remembrance (Latvijas Revolucionārio Cīnītāju Piemiņas Grāmata, reprinted 1983) where survivors and witnesses to events of the 1905-1906 revolution were testifying. If the February 4th date is New Style (Gregorian calendar) the date at the time could have been 22 January 1906. I am told Otto's gravestone in the family plot shows merely the year 1905 (perhaps mis-read for 1906 on a weathered stone? ).